Machteld Faas Xander client, IST (Innovative Steam Technologies an Aecon Company) was in need of a custom tradeshow booth that they planned to unveil at PowerGen Europe, an electricity and power technology sector event held this past June at Fiera Milano City Convention Complex, in Milan, Italy (this event alternates between Milan, Italy, Cologne and Germany annually). 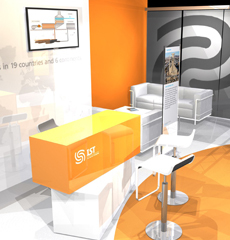 MFX worked closely with business partner and tradeshow logistics and custom exhibit design company, Moose Exhibits to create concepts for a clean, modern tradeshow booth using IST’s trademark orange, white and blue colour scheme that would welcome customers to explore IST’s product capabilities. Section 1: A comfy ‘sit down and chat’ area with a social, barista feel where IST reps could engage attendees in casual one-on-one discussion or take a seat on the modern couches for personal presentations on the iPad slide decks. Section 2: The booth’s core, consisting of a casual information area centered around a counter of marketing materials. The core area also featured an 40×45-inch touch screen, where IST reps could call up informational and visual references, technology details, cost saving-charts, etc. as needed. 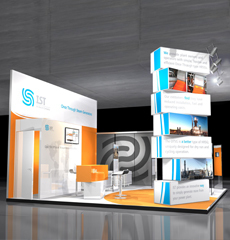 Section 3: Four freestanding plex stands, showcasing specific products from the IST line on one side and supportive customer testimonials on the opposite side. Section 4: The groundbreaking aspect, a box tower akin to a freestanding column of stacked building blocks, featuring bright IST installations on one side and relevant testimonial quotes and images directly opposite. MFX and Moose purposefully created an open, continuous flow between the three dynamic booth areas so that the deeper into the booth they ventured; the deeper into the IST brand was experienced. And this way, conference attendees could see and experience all three elements from any angle as they approached the booth. 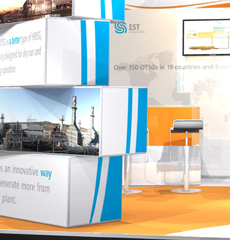 The result, was a booth that not only attracted new and potential customers on the show floor, but also provided a solid representation of the (IST brand and it’s ethos of innovative technology and products that are helping drive the boiler industry forward. posted by admin on July 11th, 2011 | Unicorns: The Future of Rapid Transit in KW? If you’re thinking unicorn, you not only took part in many a St. Paddy’s day, you also nailed the re-emerging, yet delightfully surprising theme in our ‘Draw it Up’ train car, Machteld Faas Xander’s interactive activity at Steel Rails 2011. Yes, we had unicorns a plenty depicted by you, but in Marc’s case, a unicorn represents his future hope for rapid transit in Waterloo Region. A system that would not only be magical to catch a ride on, but also provide a real personal transportation option that would take you anywhere you’d like to go. Kind of reminds me of Falcor in the NeverEnding Story. Man, I loved that movie. Still do! Before I get away from myself with my own dreams of riding the skies on a luck dragon and eradicating bullying in one full sweep, I’ll let Marc take it away. Not only was he nice enough to not only draw for us on the train, but he also took the time to give us a verbal interpretation of his art. What do you think? And what the lucky stars could so many unicorns mean for the future of Waterloo Region? This year, our thoughts remained focused on our ideal: people working together to co-design a better #KWawesome. However, we decided to add a little twist and make the activity in our train car more visually interactive, by asking participants to draw their answers to one of our three community-focused questions. And as promised, we’ve already started—albeit slowly—revealing visual squares illustrated by our train car riders. You can’t blame a girl for wanting to create a little anticipation, can you? Well today, I’ve decided to play nice and reveal three more quilt squares! Question #1: What three wishes do you have that would make Waterloo Region an awesome place to live? Our Interpretation: Creating a space for outdoor community theatre and arts, surrounded by the beauty of nature. I hope everyone had a fabulous Canada Day long weekend, and a wonderful Independence Day (to our neighbours in the U.S. of A)! Every Canada Day, I find that I get a little sentimental and misty-eyed when it comes to reflecting on this fine nation of ours. So much so that I, annually, find myself pondering on how lucky I am to live in this beautiful country, and in Waterloo Region on a more community-focused level. That’s why I thought that returning to our Steel Rails discussion post-long weekend would give us all the warm fuzzies (I’m a thoughtful gal, am I not?). 1. Density: A critical mass of caring people to make great things happen. 2. Gentrification: In other words, money, or folks with the means to invest in this city. 3. Multiculturalism: Enough different opinions—and multi-cultures are a terrific way to start a dialogue. Many thanks to Lia for contributing her beautiful artistic talents and thoughts to our “Draw It Up” activity. So now is the time to tell us what you think … what do you believe Waterloo Region needs more of to make it a thriving, dynamic community?